As per the earlier post, the fall below the 100 and 200 hour MA did find early sellers against that MA level. Bears stay in control. 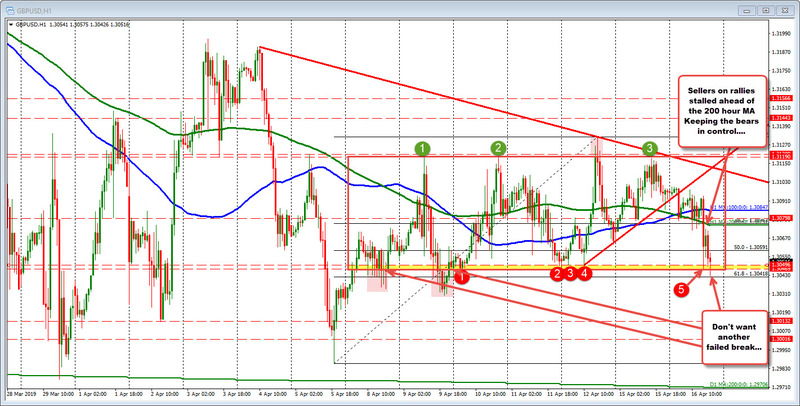 The price has moved to new lows and moved outside the "red box" defined on the downside at 1.30489. The low reached 1.3042, but has bounced back above the low of the "box". The price is still hanging near that 1.3048 level - so although the potenial exists for a failed break, it seems the sellers are giving some patience for more downside. However, traders will want to see a resumption of the downside soon. If not, we could see the sellers turn back to buyers. Shorts are hangin on to control, but they need to muster enough downside love to give the pair another shove through the next targets. If not, they may look to cover. Be aware.